I agree to receive text messages from cargovancanada.com representatives and understand that no consent to texting is required for purchase of products or services. 2013 EXPRESS *ALL WHEEL DRIVE* from $21,800!! MORE THAN POSTED! PLEASE CALL !! ♣ ALL CANADIAN VEHICLE ♣ NON RENTAL !! I(each applicant) understand that my application will be shared with the dealer as well as third party financing entities.I understand that you, the dealer, will review my application on behalf of itself or on behalf of affiliated entities that provide automotive financial services to dealers or directly to consumers. I understand this partial application may not provide sufficient information to make a credit decision. If this occurs, I agree to provide the additional information required to the dealer. If I do not provide this information, I understand my application will be incomplete. I also understand that further information may be requested by you, the dealer, or any third party entities that provide credit. In order to successfully transmit and receive the information and disclosures related to this credit application, I understand I must have an active Internet connection, a browser capable of sending and receiving secure information and the ability to print pages from this Web site for my records. I consent to receive the information, follow-up communications, and disclosures related to this credit application and any subsequent credit transaction from you, your affiliates, agents and service providers, in writing, verbally, or electronically. This consentincludes, but is not limited to, contact by manual calling methods, prerecorded or artificial voice messages, text messages, emails and/or automatic telephone dialing systems using any e-mail address or any telephone number I provide, now or in the future, including a number fora cellular phone or other wireless device, regardless of whether I incur charges as a result. I agree that you, your affiliates, agents and service providers may monitor and record telephone calls regarding this credit application and any subsequent credit transaction to assure the quality of your service or for other reasons. I understand that each time I submit a credit application, a notice will be placed on my credit report. I certify that the information that I submit with this application is true and complete to the best of my knowledge. I further certify that I have attained the age of majority. I authorize you to check my credit and employment history, and to provide and/or obtain information about credit experiences with me. 2011 EXPRESS ALL WHEEL DRIVE PASSENGER/CARGO from $16,5OO!! 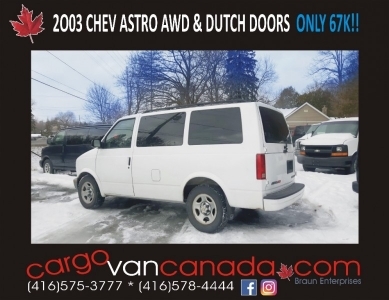 2003 CHEV ASTRO AWD & DUTCH DOORS ONLY 67K!! 2014 EXPRESS 2500 CARGO *EQUIPPED* from $13,800!! 2012 RAM CARGO C/V *OFF LEASE* $46OO!! 2012 EXPRESS AWD PASSENGER ~ MANY IN STOCK!! 2013 Ram Cargo Van C/V Tradesman OFF LEASE!! 2015 FORD TRANSIT CONNECT PASSENGER &/or CARGO ONLY 102K!! 2012 SAVANA EXPRESS 1500 V6 CARGO "OFF LEASE" $11,900! 2013 RAM CARGO C/V VAN HARD PANEL Tradesman $6,800! 2010 EXPRESS / SAVANA 2500 EXTENDED $7800!! 2012 EXPRESS *ALL WHEEL DRIVE* CARGO $12,9OO! !